I stayed in Vegas with my brother for four days and three nights. Okay… I’m not sure if I should write about Vegas in the first place since I’m not even 21 yet, which obviously means that I didn’t get to get the legit Vegas experience. (My brother is, however, 21, which was the only reason we went there, for those who are wondering.) But after a second thought, since this is my page anyway, I can write whatever I want, right? 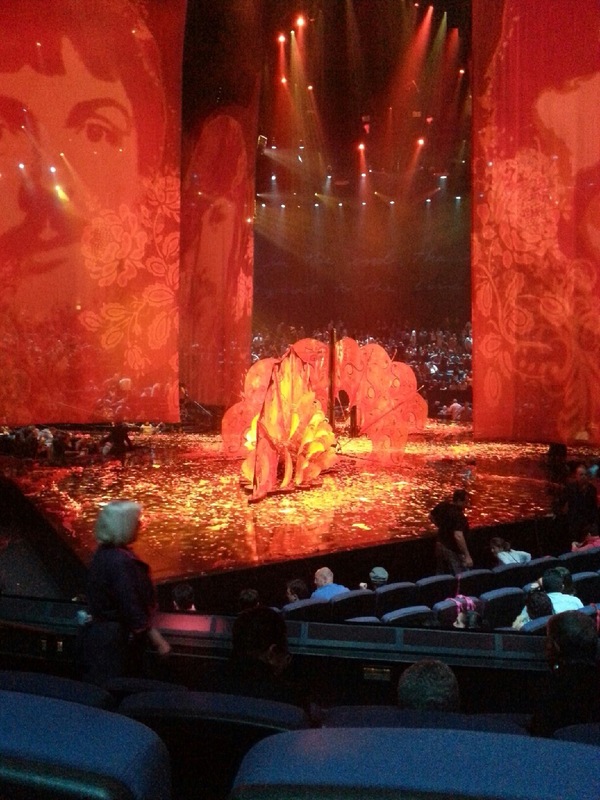 Just before the show; look at that cool visual effect–even more throughout the performance! The stage right after the end of the performance. So yeah, Love was amazing! It lasted for around 1.5 hours, if I’m not mistaken. Every bit of the performance was just so well-thought and executed: the props, costumes, lightning are all super top-notch and and the choreography didn’t involve merely flexible movements stereotypical of a circus but also beautiful dance moves. And not to mention 90 minutes of The Beatles’ songs that set the theme for each scene! I really liked the song choices, though there weren’t any of some of my all-time favorites. Also, I especially love the idea of trying to make the stage as interactive as possible. I personally find it delightful as an audience to be somehow involved in the performance and they did a good job on that. I’d highly recommend the show, especially if you’re a Beatles fan! 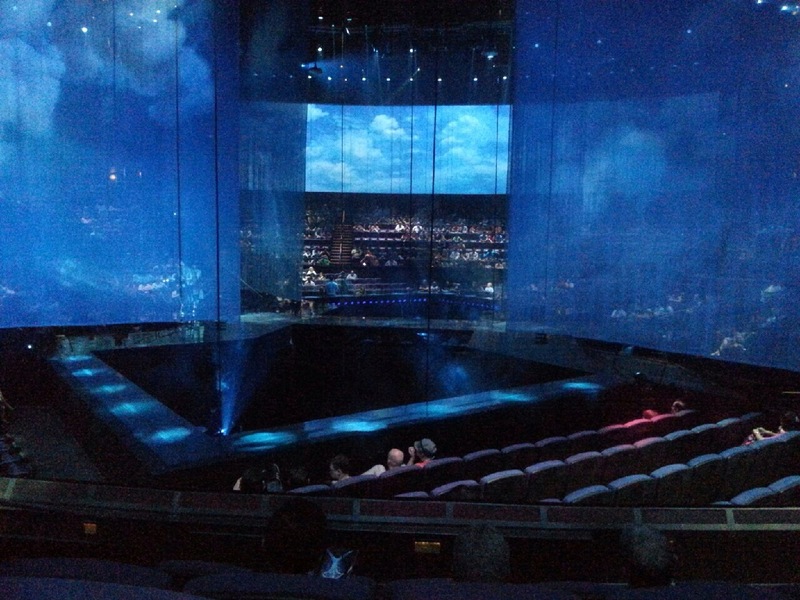 And I’d definitely go watch other Cirque du Soleil shows when I pay Vegas another visit. I stayed at Stratosphere during my stay in Vegas, which is located quite south of the Strip (nickname for Las Vegas Boulevard), and unfortunately far from its central “hot spot” where the massive crowd tends to flock–around half an hour walk away, and walking in Vegas heat means it feels like forever. I picked the hotel because 1.) it was cheap! (I paid $60ish/night in total) and 2.) I got free passes up to four people for Stratosphere Observation Deck, from which I got to see the top view of the Strip. 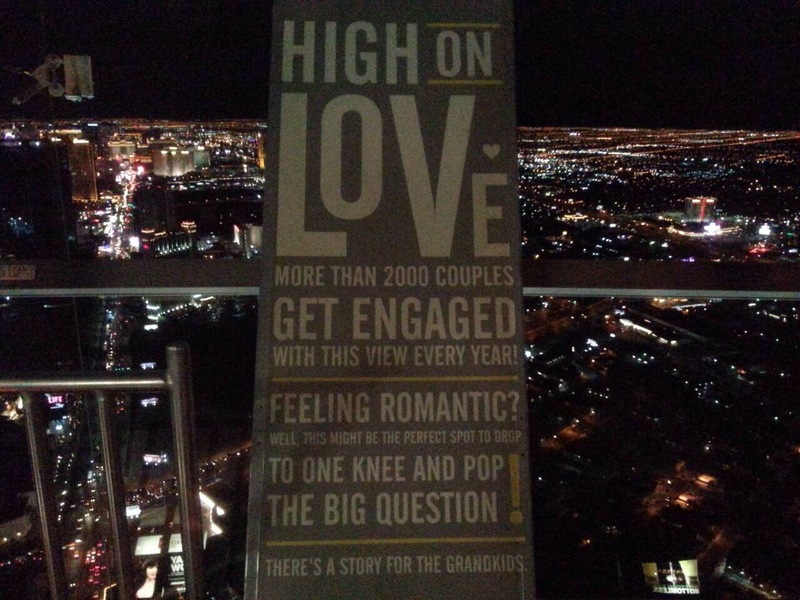 I ended up going to the Observation Deck on my last night in Vegas, and I should say that the view looked wonderful from up there. And apparently, there are more than 5,000 couples annually who get engaged there. (Random, I know, but it may interest you, whoever you are.) My brother and I also went inside a photo booth, which I was really excited about! And for those of you who are adrenaline junkies, you may consider the Thrill Rides on top of the Stratosphere Tower. They have three different rides which are all crazily scary for me and also the SkyJump, all of which you can easily google for more information. Also, if you stay at Stratosphere, you get discounted price for the thrill ride admission. If you’ve been to Vegas in the summer, then you know how crazy hot it is during the day. Even what usually counts as a short walking distance can feel like an extremely long one in this kind of weather! So if you ever decide to do some hotel-hopping, you may want to consider riding the DEUCE, which is the public bus authorized by the state. It has plenty of stops throughout the Strip; it stops pretty much almost at every hotel. The buses I rode were all double decker, and sitting on the top deck was a pretty good way to do some sight-seeing, considering the heat outside and the fact that the bus can sometimes run pretty slow, especially during peak hours! The ticket costs $6 per two hour or $8 per 24 hour–getting the latter one seems to be the obvious choice, in my opinion. Also, you can take the bus downtown and to the airport using that pass, which is another great thing about it. I especially like using the bus since I stay at Stratosphere, which–as I’ve said before–was located pretty much off the Strip, so it’s an affordable way of getting around. Just don’t lose too much money. I’d rather to use that money to watch the performances and eat some good (though overpriced) food. So you’ve probably noticed that this is a pretty short post compared to the previous ones, partly because I’m still underage to actually do most of the things people do when they’re in Vegas, and also because I don’t find the city that appealing. I definitely love the wide variety of shows there, also the fact that almost all of the hotels are gorgeous! All the gambling stuff it is mostly famous for isn’t really my scene, though, so even when I’m already 21, the trip to Vegas won’t make much of a difference to me.